I needed a "defrost" mode for my glasses yesterday morning. A defrost for my legs wouldn't have hurt either. 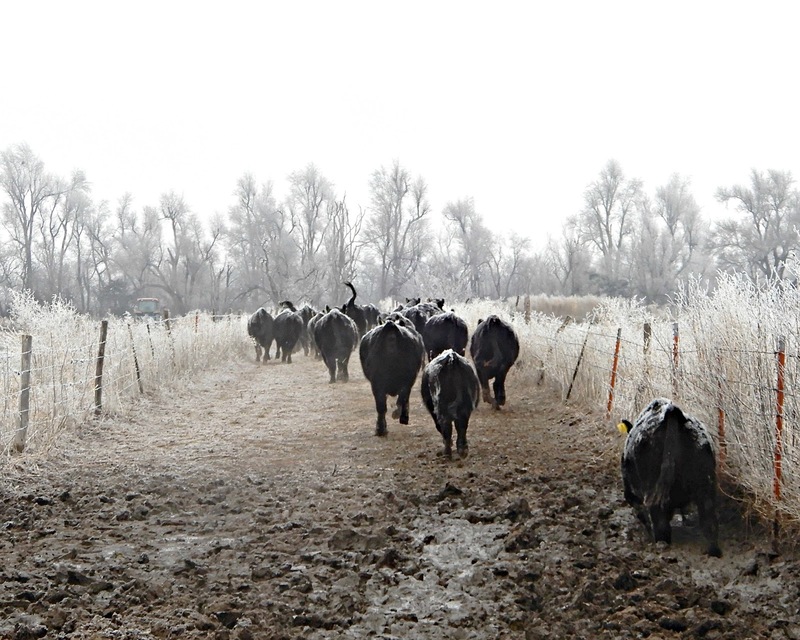 The cattle defrosted on their own during their semi ride to Pratt Livestock. Today, we'll sell 70 feeder calves, along with a baby calf whose mother has a cancer eye. All of us - humans and animals alike - were seeing our breath during the cold morning roundup before the semi arrived to transport the calves. After several attempts, the cattle finally decided to go down the lane toward the corrals. 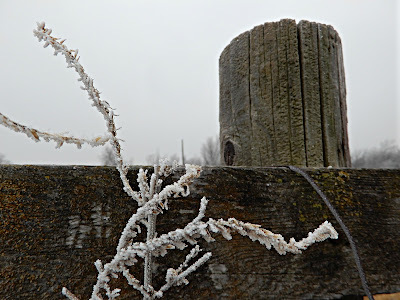 Of course, on a cold morning with freezing drizzle sticking to my glasses, they couldn't do it the first time. It was a brisk 4-wheeler ride ... with no time to shoot photos. In the photo above, you can see a straggling calf struggling through the mud. I looked up last year's post as we prepared to ship cattle. There's quite a contrast. Last year, we'd had no moisture at all beginning in the fall and continuing until early spring. We were choking on the dust down the lane and in the cattle lots. 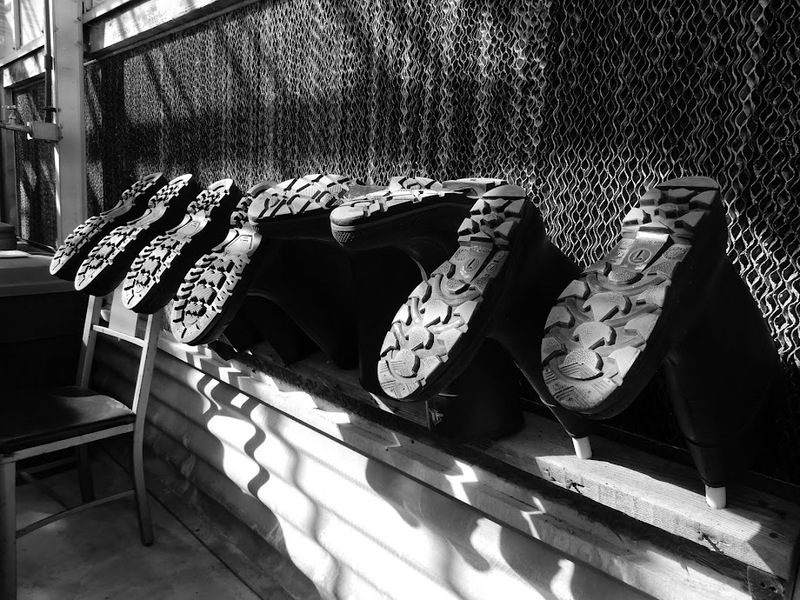 This year, we are still waterlogged from the 14+ inches of rain that fell in October. There's no way a 4-wheeler could go down the lane. 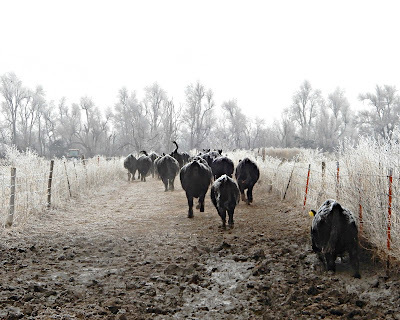 And it was a whole lot chillier this year, as evidenced by the freezing drizzle that stuck to the cattle's hides. I guarantee I was colder than they were. Ours was the second load of the day for Darrel Harner Trucking out of Sylvia. 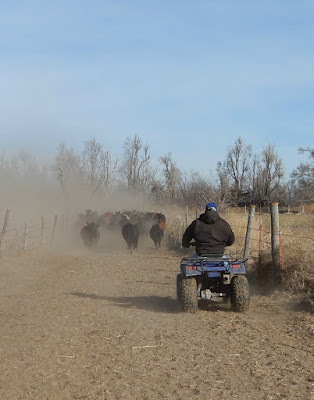 Once Darrel got the trailer backed up to the loading chute, it was time to send the feeders on their way. These were calves that were born in January and February of last year - 2018. After we weaned them in November, we've been feeding them silage and hay. On Monday, we sorted off 25 heifers that will become first-time mothers in the County Line herd in 2020. The steers and the remaining heifers went to Pratt Livestock. 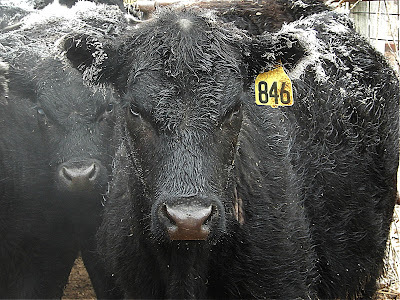 Cattle buyers will purchase them for feedlots, where they will go until they are big enough to be harvested for meat. Let's hope the sub-zero wind chills and slick roads don't keep the cattle buyers away today! Loading the truck is kind of like a jigsaw puzzle. The trucker tells us how many head of cattle he wants in each group, somewhere between 7 and 12, depending on where they'll go in the cattle trailer. And we send them up the chute and into the truck. It was a foggy trip to the sale barn. 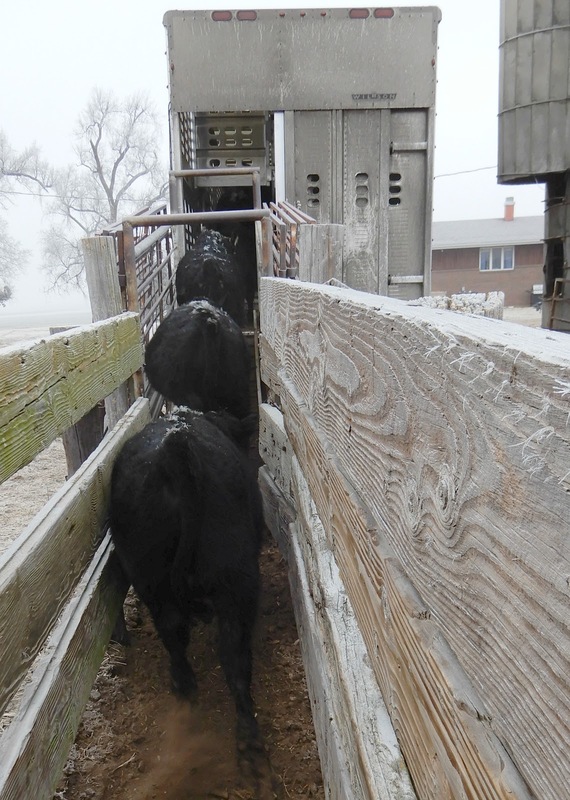 When it was time our turn to unload, Darrel backed up the semi to the sale barn's chute. An employee there counted the calves as they came off the truck. 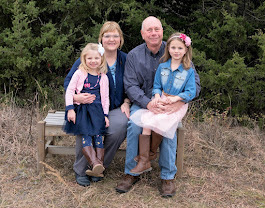 Since Darrel started his day in Fredonia and the roads were a little slick, we had a little time between the cattle round-up and the semi's arrival. I may have needed a defroster on my glasses, but the scenery was undeniably pretty. 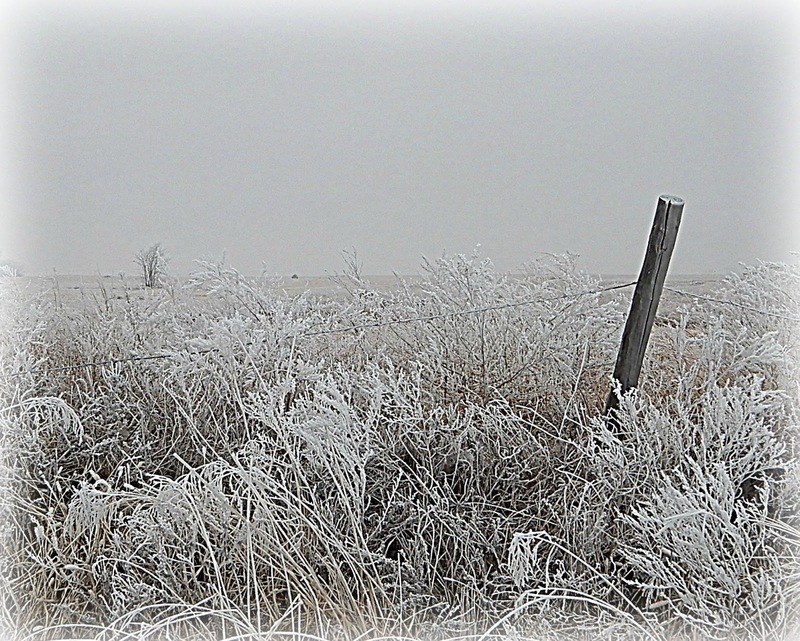 The CRP grasses caught the icy frost as aptly as the cattle's hide. 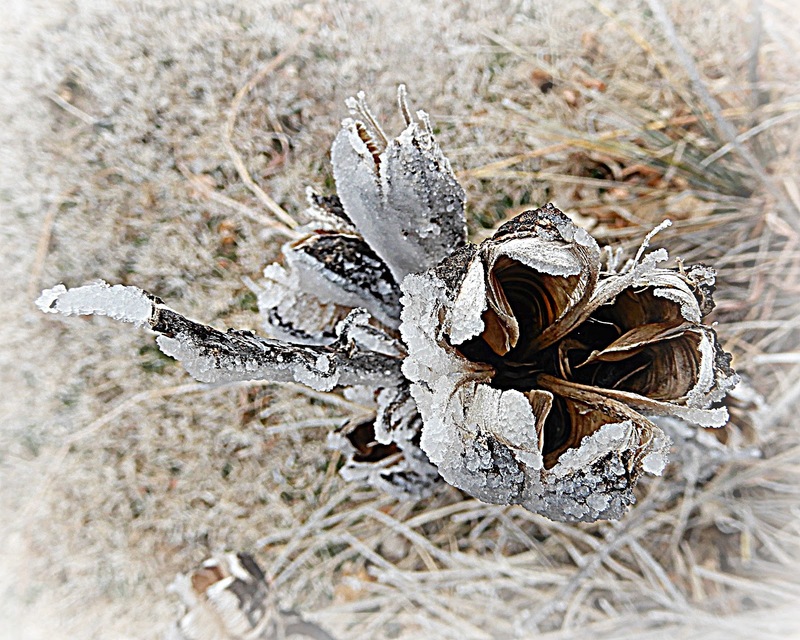 So did a dried flower at Peace Creek Cemetery. 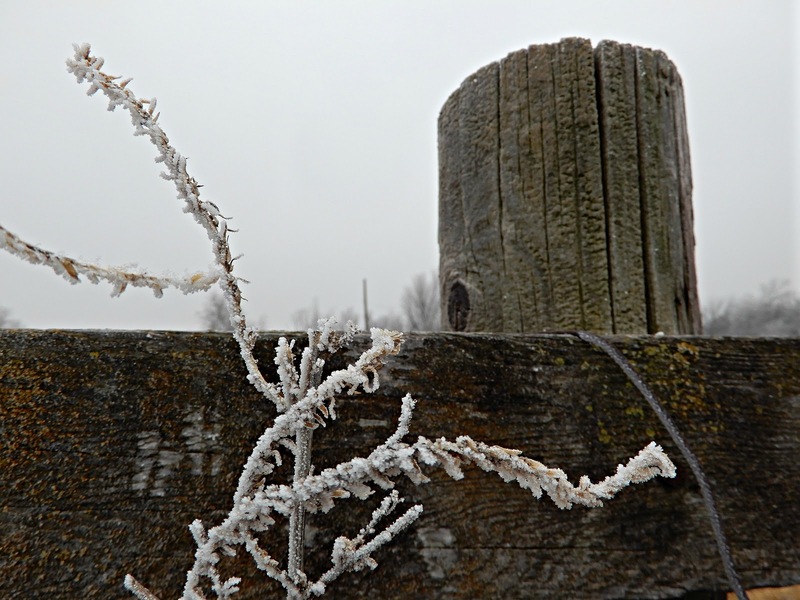 A chain on the working chute provided another canvas for the clinging ice. Today is even colder, with wind chills below zero. I'm glad the round-up was yesterday and we can spend the day in the relative warmth of the sale barn arena. It's never toasty warm, but it's better than a 4-wheeler ride! 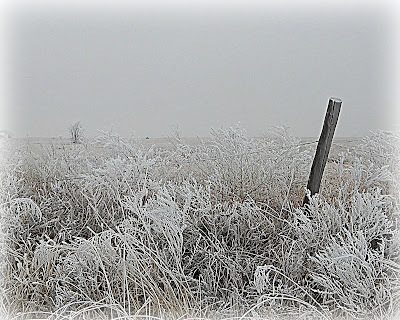 Jenna told us that Kansas weather had turned pretty cold again, and there's no arguing with those pictures!! 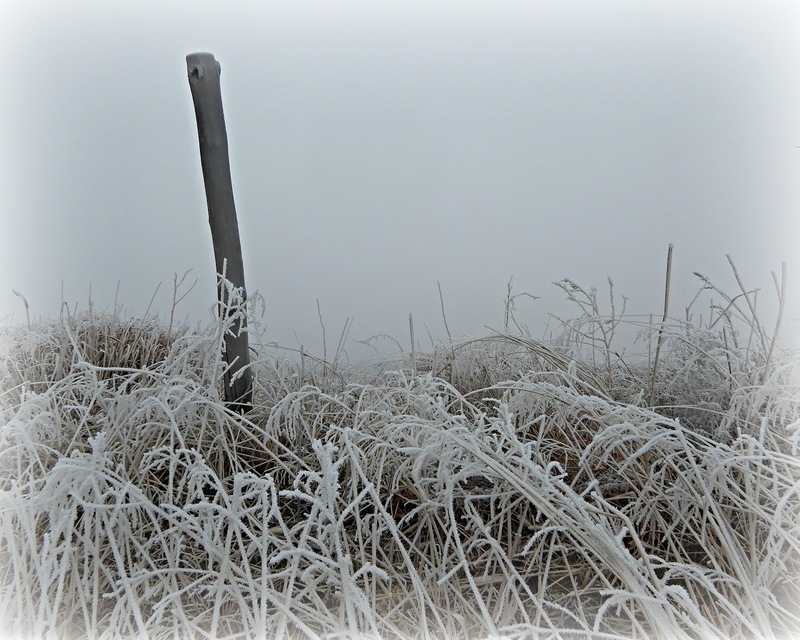 I must say, the frosty pictures sure are pretty, but I feel for you, being out in that cold! Those cattle trailers sure are bigger than ours here. How many can they hold? 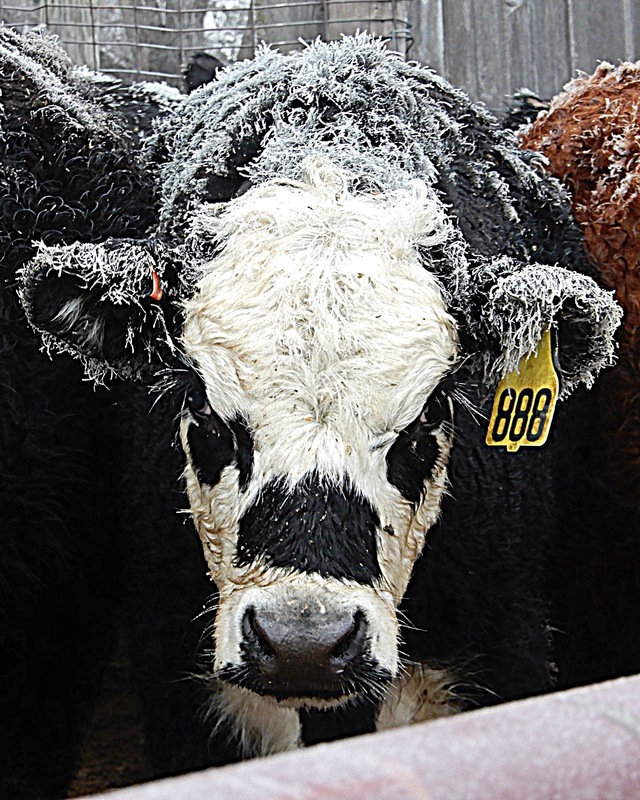 The trucker who hauled our cattle this week could haul 55,000 pounds. Some semi trailers haul 50,000. So it depends upon the size/weight of the cattle. Our 70 head of feeder calves weighed 50,005 pounds, so a few more could have fit on the truck. In years past, we might not sell until early March. In that case, they would have weighed more. Sometimes, we have to haul some in our farm trailer. What a job in those conditions and what a contrast to last year. I sincerely hope the sales go well for you. Thank you, Helen! 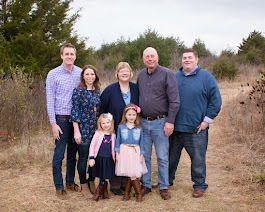 I'll have a sale barn report next week. I just love that first photo! Maybe one for this year's fair? Yes! I keep a running list in a notebook to make it easier at fair time. It's on the list. Thanks!